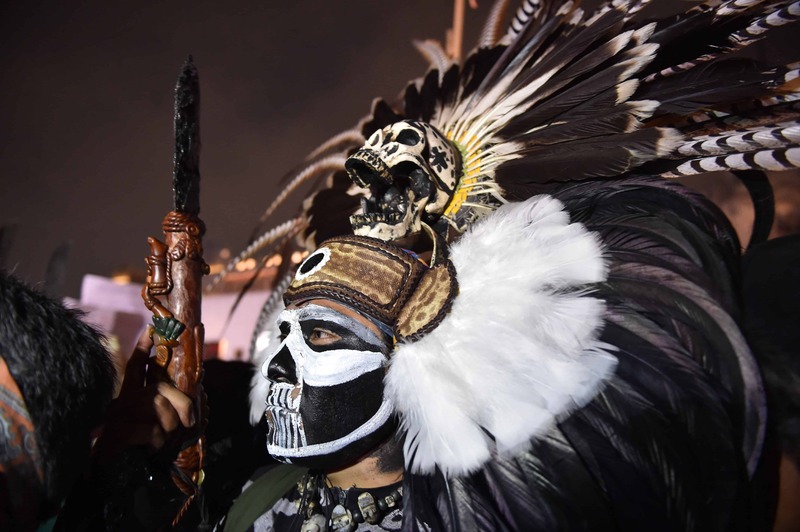 MEXICO CITY – Tens of thousands of black-clad protesters angry at the presumed slaughter of 43 students marched in Mexico City on Thursday, chanting for President Enrique Peña Nieto’s resignation. 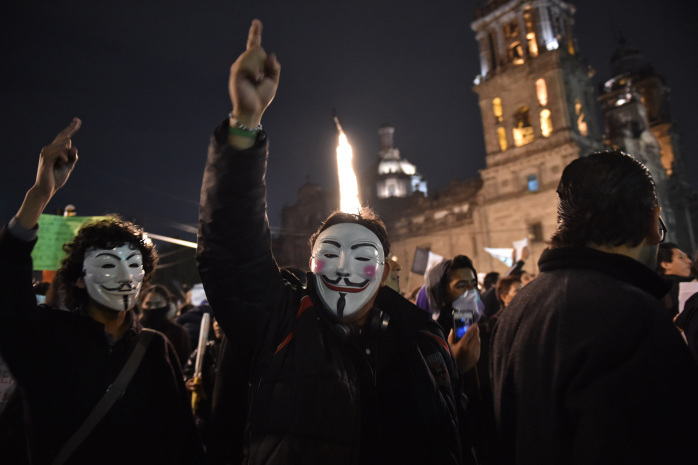 Parents of the 43 male college students, who reject claims their sons are dead, led the march to the historic Zócalo square, in front of the National Palace. It was the latest protest over the government’s handling of a crime that has infuriated Mexicans fed up with corruption, impunity and a drug war that has left more than 100,000 people dead or missing since 2006. The case has turned into the biggest challenge of Peña Nieto’s nearly two-year-old presidency, on top of another scandal over a mansion his wife bought from a government contractor. Prosecutors say a drug gang confessed to slaying the students and burning their bodies after receiving them from corrupt police in the southern state of Guerrero in September. “Mexico is used to tragedy, robberies and corruption, and we need to begin to exercise our rights as citizens to get the government working,” said Lili Correa, 46, wearing black. The demonstration coincided with the anniversary of the start of the 1910 Mexican revolution, prompting the government to cancel the annual parade. Before the march, masked protesters threw firebombs and used bazooka-like tubes to launch firecrackers at riot police, who hit back with tear gas to disperse the group on a street near the airport. Around 15 people were detained. Hundreds of protesters blocked the main road to the airport for an hour, while police vehicles picked up passengers walking with their suitcases along the road. Thousands protested in several other cities, including Chilpancingo, the capital of Guerrero, the violence-plagued southern state where the students vanished nearly two months ago. Thousands more marched in Bolivia and some 200 took to the streets in El Salvador. Mexico and Real Madrid football star Javier “Chicharito” Hernández tweeted a picture of himself wearing a black hoodie and the hashtag #WeAreAllAyotzinapa, referring to the young men’s Ayotzinapa teacher-training college. “This is a nationwide problem. Nothing like this happened before and Peña Nieto doesn’t care, he’s useless,” said Luis Ángel García, a 19-year-old Ayotzinapa student. With the annual parade called off, Peña Nieto led a ceremony with top officials at the Campo Marte military field, where he and the defense minister denounced violent protests. “Mexico is hurting, but the only path to soothe this pain is through peace and justice,” he said, hours after making his personal assets public to quell conflict of interest allegations over his wife’s mansion. The crisis erupted after the mayor of the city of Iguala ordered police to confront students on Sept. 26, sparking a night of violence that left six people dead and 43 missing, authorities say. Members of the Guerreros Unidos drug gang told investigators they killed the students and burned the bodies for 14 hours after police had handed them over. Officials stopped short of declaring the students dead pending an Austrian university’s DNA tests on charred bones. Federal authorities continue to search for them in Guerrero. Buses carrying parents of the missing students joined the march after a week-long tour of the country to voice their anger over the government’s handling of the case. Highlighting their deep distrust of the government, they refuse to accept that the students are dead and say they will only trust DNA test results from independent foreign forensic experts. “We are moving forward, until the end, until they reappear,” Epifanio Álvarez, father of a missing student, told AFP.